With over 10 years experience developing pest control products, you can be sure you've come to the right place for your cat deterrents. Primrose stocks a wide range of solutions from non-electronic fence spikes and cat silhouettes to electronic water sprays and ultrasonic repellers. Cat deterrents are pest control products used to deter cats from entering a particular area. They target the animal’s highly-attuned senses, whether it be smell, vision or hearing, making it uncomfortable for them to remain, causing distress, but not harm. Cats are the perfect pet for many people. However, for a lot of us, these seemingly cute pets can be an absolute nuisance. From dipping their paws into the fish pond to leaving un-wanted 'presents' in the garden, cats can be a real annoyance to garden owners. 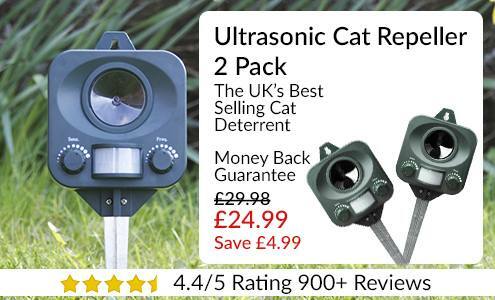 We provide a wide range of easy-to-use cat deterrents to help repel cats from your garden. From fence and wall spikes to ultrasonic cat repellers, you're sure to find the perfect solution. How Do Cat Repellents work? Cat repellents make felines uncomfortable by preying on three of their super-sensitive senses - vision, hearing, and smell - and conditioning them to associate your garden with these sensations. Cats are equally active both day and night and can see at a sixth of the light required for human vision. Their hearing is superb, able to hear an extremely large range of frequencies, including ultrasound. Cats have an acute sense of smell, originating from an advanced olfactory bulb and olfactory mucosa - the latter with a surface area double that of humans. They can detect pheromones and respond strongly to plants that contain nepetalactone, which they can detect at less than one part per billion. Ultrasonic cat repellents work by emitting a very loud noise at frequencies inaudible to humans - but audible and important to cats. Cats use ultrasound to hunt rodents and other small mammals by eavesdropping on their ultrasonic communications. Primrose’s repellers possess a number of unique features that make them the best in the market. Firstly, their motion sensors turns the device on only when a warm body enters the area. This ensures the device only emits sound in the presence of animals with the animals associating their presence with the noise. (It also saves battery life.) Secondly, its behaviour specific timing ensures ultrasound is emitted at random intervals making it impossible for the animal to become accustomed to the noise. Lastly, it's hyper-resonance frequency covers a frequency range that provides maximum resonance with the ear canal, jumping sharply between frequency levels to provide maximum discomfort.This contrasts with conventional repellers that simply fluctuate or raise the level of sound, which is easier to adjust to. Famously, cats hate getting wet and can often be seen hiding under cars to avoid getting drenched. Our jet spray deterrent will spray cats when they pass in front of the sensor. Cats can be discouraged by reducing the areas they can perch. Cats enjoy settling in high places, which gives them a nice view of their territory. Hence, cat fence spikes are the perfect solution that make it impossible for them to rest conformably on garden fences, or even traverse them. Granules and Sprays contain chemicals and pheromones that cats associate with danger or simply can’t stand. Silent Roar, for example, contains the pheromones of lions, which cats will not risk investigating. Plants work in a similar way. We recommend lavender that as an evergreen will remain in flower all year. Cat silhouettes work by emulating the look of a cat without its personality. These figures unnerve cats due to their unnatural behaviour - staying deadly still. 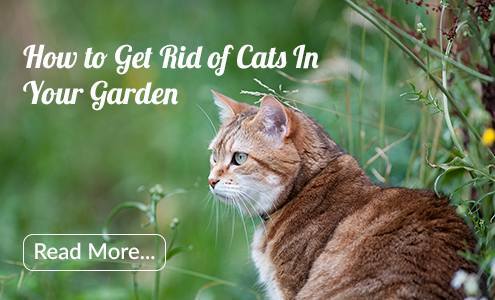 What is the best cat repellent for my garden? While ultrasound devices are the most effective they often require batteries or access to the mains, so there is an additional cost involved. Ultrasonic deterrents, however, are small and will not blight the look of your garden. Lavender is great for pollinators, providing a source of nectar for the UK’s dwindling bee population. Granules and spray will eventually run out, so will require repeat purchases. Cat silhouettes and fence spikes offer a nice long term solution without the need for maintenance. Fence spikes have the additional advantage of securing your garden from intruders. What do I do if I’m unhappy with my product? Our products have been extensively tested in wide range of environments and we are confident they will deter cats. Some products will not work immediately, so we recommend you wait at least two weeks before passing judgement. As with all of our products you are guaranteed by the Primrose Promise which gives you two years warranty on everything, allows you to return products within 60 days, as well as a best price guarantee and next day delivery on selected products.